Last Friday’s Episode managed to reach more than 7 millions live viewers, setting a new live audience record for Season 2. Also, “Original Jack Dalton” Bruce McGill will guest-star in an upcoming episode! It looks like production is gearing up for a well-earned holiday break because filming continued on the last two weekends. Due to evening and night shoots, cast and crew didn’t get to watch the latest episodes because they were still on set when the show aired. They still take the time to post some pictures for us and thankfully, George Eads hasn’t lost his new-found love for Instagram yet. On October 26, he revealed that Jack Dalton will have to wear a suit again. On a photo posted on November 1, he joked that Jack at least was trying to help. The BtS picture shows cast and crew filming on and under a soundstage. Judging by other location pictures and Instagram Live Stories, it looks like MacGyver is trying to defuse a rather large bomb. Eads also pleased the fans by posting pictures of him doing ADR (Automatic Dialogue Recording) and thanking for the great ratings last Friday. 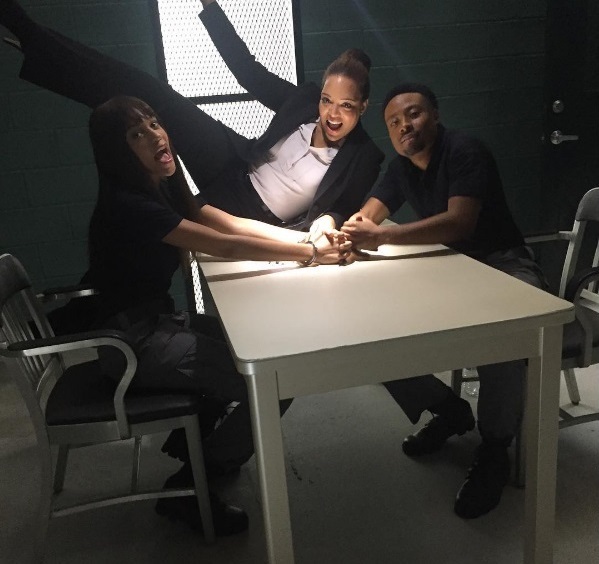 Justin Hires shared a picture of Bozer being in trouble again, getting interrogated in prison. At least he had some beautiful company on set, even if one of them has a habit of trying to look into his phone. Justin also shared a picture of him and Lucas on set, their characters apparently taking a break from playing Ping Pong in the lab. Meredith Eaton just posted an Instagram Live Story today, revealing that she’s doing ADR for Episode 2×09. On October 25, Tristin Mays had shared a video of her driving a Sanitation Truck. As it turned out, this scene will be part of another “explosive” Episode because Emerson Brooks (who played Charlie Robinson in Episode 1×06: Wrench) was back on set and most likely, “The Ghost” will make a comeback as well. Last week, they had lots of Extras on set; mainly SWAT, FBI and Bomb Techs. Meredith Eaton called it “a situation”, so I guess there will be lots of action. 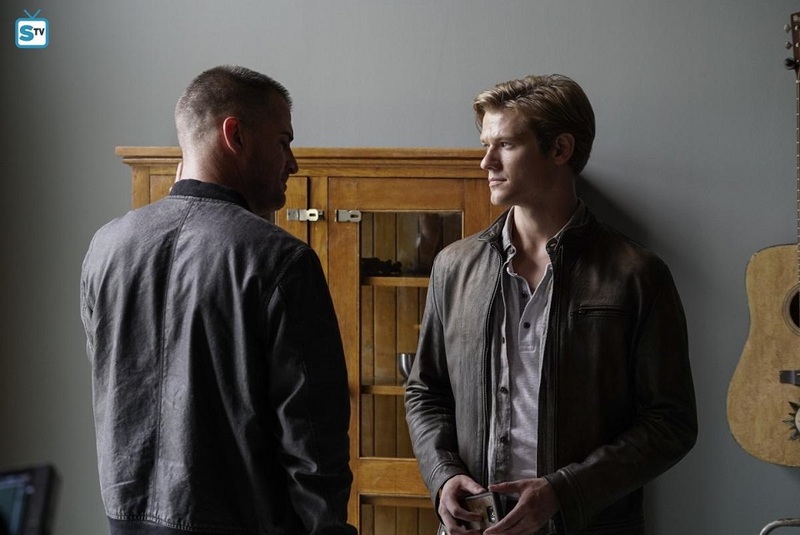 On November 7, George Eads posted several pictures of him and with Lucas Till in “Afghanistan”. 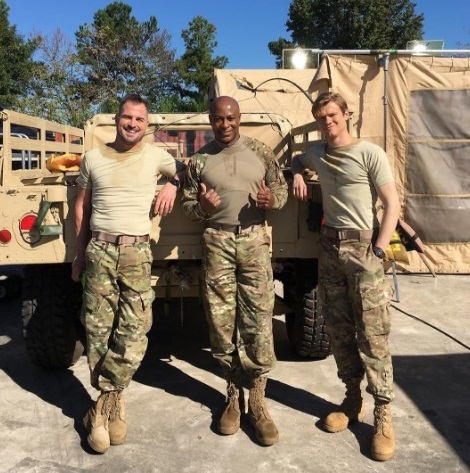 Back in October, we had already seen BtS photos posted by Garfield Wedderburn that featured him with Lucas and George in soldier gear. Months ago, Executive Producer Peter Lenkov had promised we would get to know how Mac met Jack. 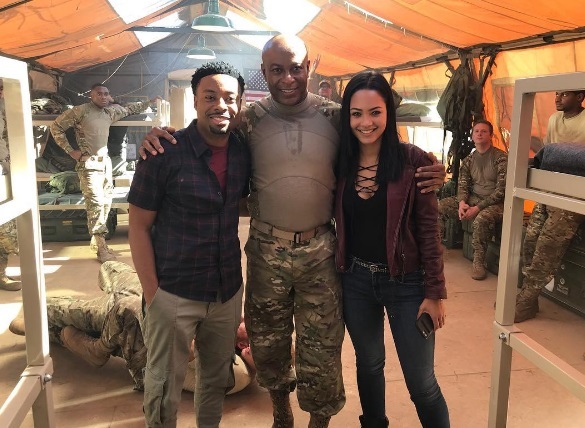 The fact that both Tristin Mays and Justin Hires have been on this desert set as well means the episode is set in current time, but set location pictures, Instagram Live Stories by Lucas and and the most recent BtS photos by George hint at flashback scenes to Afghanistan when Jack was still with Delta and Mac an EOD Tech. 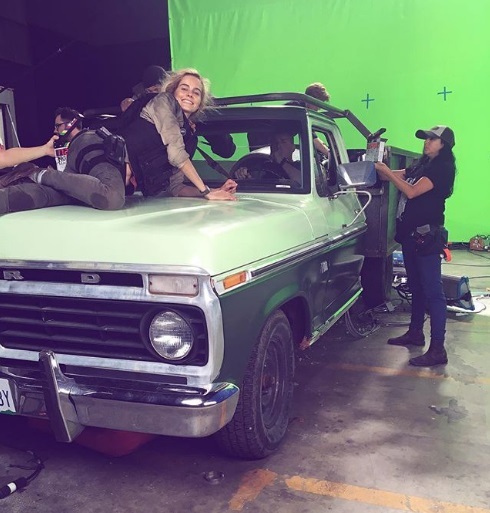 Isabel Lucas doesn’t post much, but shared a BtS-picture of Episode 2×06 that shows her on the hood of a car. Interestingly, she hasn’t been seen on set pictures or videos for weeks. Either Samantha Cage has very good Ninja Skills or she went to travel the world with Murdoc. On November 3, we got the Press Release for Episode 2×08 (Packing Peanuts + Fire) and a first Still of Riley with her father. On November 7, CBS added more Official Stills for Episode 2×07 (Duct Tape + Jack). We also got the title for Episode 2×09: CD-Rom + Hoagie Foil. Sadly, we got no Sneak Peeks in advance of Episode 2×06, although they had only released one single Offical Still beforehend. There were no Sneak Peeks for today’s Episode 2×07, either. Thanks to the cast, we got some more BtS material of the episodes, e.g. the stunt-scene of Bozer’s stunt double being on fire in last week’s episode 2×06. On October 26, CBS Watch! 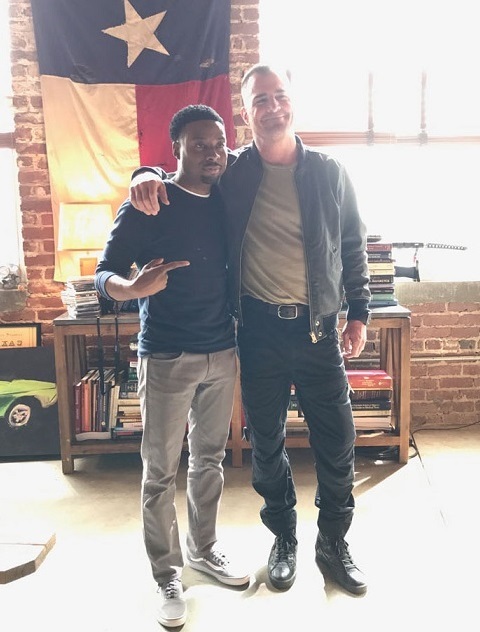 Magazine had posted 14 BtS Set pictures of Justin Hires with various cast members; giving a “tour of typical MacGyver moments”. Some of these photos are on-set-pictures from last week’s Episode 2×06 (Jet Engine + Pickup Truck); making up for the lack of Official Stills. We also got a glimpse of Jack Dalton’s “homebase” that we will visit in tonight’s Episode 2×07 (Duct Tape + Jack). One of my favorite scenes that Matty has in Season 2 is with Murdoc’s son. There’s a real poignant moment where she’s talking to him, and Matty reveals part of her own past to his son. It’s a really sweet scene between the two of them. That was really enjoyable. Interestingly, that’s actually a scene for Episode 2×04 (X-Ray + Penny) we never even got to see. It’s still a possibility that it ends up in a later episode, but more likely as a Deleted Scene on the Extras of the Season 2 DVD. For Halloween, CBS additionally posted an interview with Sarah Downer, Costume Designer on the Reboot. Besides giving tipps on Halloween costumes (e.g. which substance to use for fake blood), she also talked about how they had decided which costume of the “Zombie Wizard of Oz” theme to use for each actor. While the Season 2 ratings for the first four episodes hadn’t been overwhelming, they were stable: On average, every episode pulled in 6.65 million live viewers per episode so far with a rating of 0.8. The Halloween Episode on October 27 aired an hour later than usual and took over the time slot of Hawaii Five-0. Furthermore, there was a World Series Game going on that evening and Season 2 of Stranger Things had just dropped on Netflix, so ratings weren’t really predictable. Yet, we were in for a surprise: Episode 2×05 (Skull + Electromagnet) reached 6.45 million live viewers with a rating of 0.9 in the important demo-group (18-49). Episode 2×06 (Jet Engine + Pickup Truck) last week was the first Season 2 Episode to reach more than 7 million viewers; managing 7.09 million live viewers with a demo of 0.8. Today, TV Insider revealed more infos about Bozer’s new love interest, an ambitious operative-in-training called Liana. Reign Edwards will join the cast for at least 3 episodes “and possibly more”, starting on November 17. It’s possible they’re testing the waters with Edwards as a potential recurring (or even regular) cast member since many fans didn’t take Isabel Lucas joining Team Phoenix so well. As I mentioned, Emerson Brooks has been back on set as Charlie Robinson, Mac’s fellow EOD friend. Other upcoming guest-stars are Billy Baldwin as Riley’s father (in Episode 2×08: Packing Peanuts + Fire), Eddie McClintock and Ashley Tisdale as a CIA Agent. 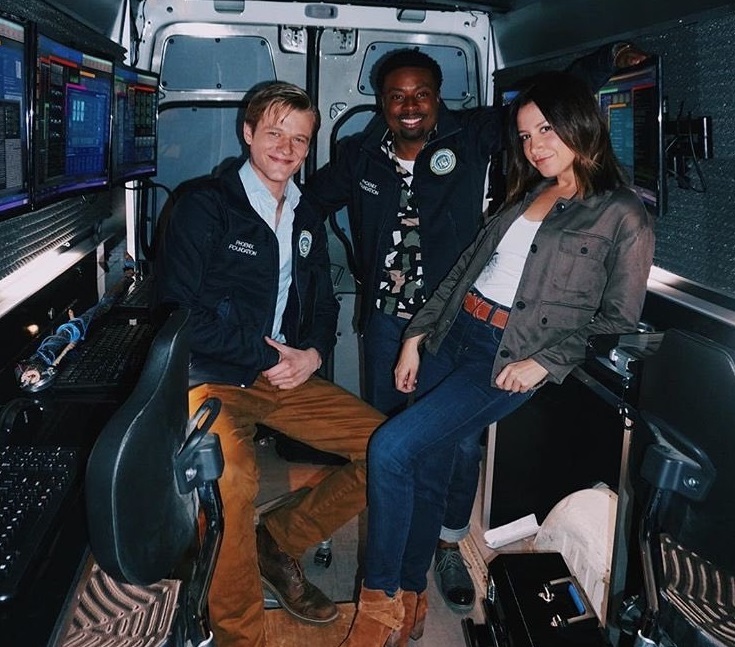 Both Justin Hires and Lucas Till shared BtS pictures and videos of them with Ashley on set and having fun. Probably the most exciting casting news is that none other than “Original Jack Dalton” Bruce McGill will guest-star in an upcoming episode! 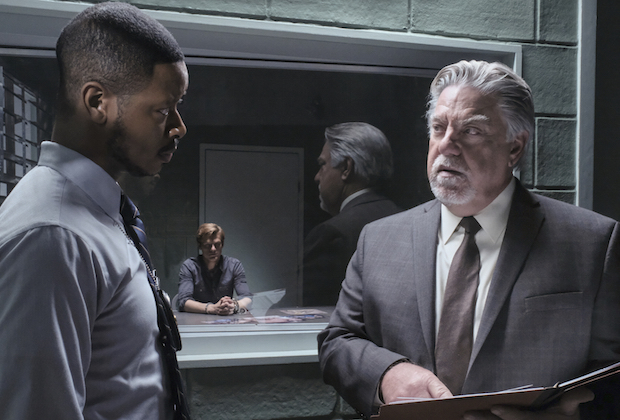 On November 3, news about Bruce McGill’s appearance in the reboot hit the internet. As Entertainment Weekly reported, McGill will play Detective Greer, a seasoned LAPD veteran who reads MacGyver his Miranda Rights for murder. Greer believes that MacGyver is a bomb maker who took down a warehouse, killing someone, and intends to charge him with domestic terrorism. I was happy to make a guest appearance on MacGyver. It’s unusual for an actor to be on the original series and then, 30 years later, be on a newer version. The cast and producers were warm and embracing, and I enjoyed being a part of the new show. 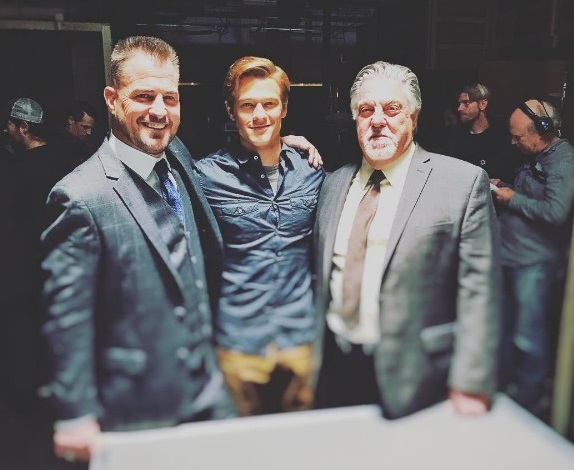 Lucas Till posted a picture of him with rebooted and Original Jack Dalton on Instagram, stating his excitement about working with another actor of the original cast. TV Line had added an Official Still to their post, stating that the episode will air on December 15. The description for the Still reveals that it’s Episode 2×11 (Bullet + Pen), directed by Carlos Bernard. It’s not clear yet if this will be the Midseason Finale or if they will additionally air Episode 2×12 just before Christmas. Interestingly, the storyline for this episode reminds me of the background story James Wan had intended for a MacGyver movie back in 2012, in which MacGyver was wanted for terrorism and had to clear his name. Of course, it’s not just about guest-stars. After all, TV wouldn’t work without Extras. Central Casting Georgia has been looking for Stand-Ins, Photo Doubles, a Bomb Squad, Men who are currently or have been real Firemen, for Soldiers, FBI & Police, SWAT and Agents or for LAPD Bomb Techs. They’ve also been looking for a Man with a Car, Bartenders, Men and Women who portray Middle Eastern or East Indian for a small Bazaar Scene, Office Workers and Men with military or tactical experience. The Reboot started airing in several Latin American countries recently. There were some screening events beforehand. Depending on the venue, journalists gathered to conquer “MacGyverland” (Colombia) or had to disarm bombs (Argentina), solve puzzles, crack open a safe or to step over laser lights without getting “harmed”. There were fake missiles, confetti bombs and fighting stunt men. They also got their own paperclip goodie to take home or were able to visit the “spy van”. Episodes 1×07 (Can Opener) and 1×08 (Corkscrew) garnered 69’000 resp. 73’000 viewers. Episodes 1×09 (Chisel) and 1×10 (Pliers) reached 76’000 resp. an impressive number of 105’000 viewers. Tomorrow, Austrian channel ORF1 will air the German-speaking TV-Premiere of Christmas-Episode 1×11 (Scissors). There will be no episodes for the next few weeks due to the upcoming Winter Sports Events. There’s no information yet when fans finally get to see the German-speaking premieres of Episodes 1×16 (Hook) and 1×19 (Compass). Reblogged this on MacGyver Global.